HomeSeed Starting - It's That Time Again! Seed Starting - It's That Time Again! There are many advantages to starting your own seeds. Everyone has their own reasons, not the least being that watching those green babies grow helps many of us get through a long New England winter. Some of the many advantages of nurturing your own plants from seed include less expense, you can choose which varieties you want and choose from a much broader selection. You can grow your own seedlings organically, and have healthier and more nutritious food for you and your family. Starting seeds yourself also minimizes the chance of introducing soil-borne diseases to your garden, and your individual, loving attention will yield healthier and higher quality plants. You can also time planting to your own schedule and needs. You can start your tomatoes extra early for the first ripe tomatoes in the neighborhood, and start broccoli for a fall planting. It's always best to start with fresh, high quality seeds. Mail order seed catalogs and seed packets can provide important information. First look for hardiness for your area and days to maturity, to make sure you have enough growing days. You'll also want to get information about each seed's germinating needs. Do they need light or dark, cool or warm temperatures? Some seeds need soaking, some stratification to break dormancy, and some need to be scarified. You'll also need to know how many weeks before planting outside sowing is advised, usually between four to ten weeks. There are only two requirements for containers to start your seedlings. They must be scrupulously clean, and afford proper drainage. There are two main styles, seed trays or flats, and individual seed containers. You can buy them new, clean used ones, or recycle empty yogurt, milk and similar containers. A solution of 1/8 cup bleach to 2 gallons water can be used to rinse used or recycled containers after a soap and water cleaning to prevent disease. No one perfect medium exists. Seedlings thrive in a moist, spongy growing medium. "Soil-less" mediums work really well here, and usually contain a blend of vermiculite, sphagnum moss and/or peat, and Perlite. They work better than garden or potting soil, as they retain moisture, provide good aeration, and reduce pest and disease problems. You can mix your own using 1/3 to l/2 sphagnum moss or peat, and the remainder vermiculite or Perlite. Ready-made mixtures like Pro-Mix work great and are readily available. Whatever you use, it MUST be sterile. In order for a seed to germinate, it must be mature and viable, and receive the proper combination of moisture, temperature, light, and air. Most annuals, vegetables and herb seeds germinate easily. However, there are some that need special attention. Perennial seeds, in general, need more attention than others. Some seeds may need either complete darkness (Calendula, Bachelor Buttons, Larkspur) or constant light (Snapdragon, Petunia, Yarrow) to germinate. Some need to be soaked (Parsley, Asparagus, Morning Glory) because their seed coats are very hard, preventing moisture from getting through. Some seeds may contain a chemical substance that inhibits germination. Soaking is then needed. Some seeds need stratification, a cold treatment, before sowing (such as Echinacea, Lavender and Columbine). Some seeds need scarification (Lupines, Sweet Peas), by nicking or filing, before sowing. Some seeds need cool temperatures to germinate. Examples include Rosemary, Lettuce, California Poppy. Some seeds do not transplant well and should be planted in peat pots, examples being Nasturtium, Dill, and Poppy. This information is usually provided in the seed catalog, on the seed packet, or in a good gardening book. 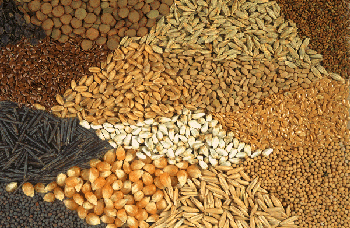 Very fine seeds should not be covered with medium, but merely pressed into the surface. All other seeds, except those that need light to germinate, should be covered with one to two times their thickness, then watered carefully. To provide consistent moisture, some gardeners cover flats with clear plastic, which should be removed as soon as germination occurs. Make sure you label each flat, row, or container, and place in a warm area. Most seeds germinate best at about 75 degrees unless otherwise stated. Check your seeds daily for germination and soil moisture. Soil should be kept moist, not wet. Use tepid or room-temperature water. 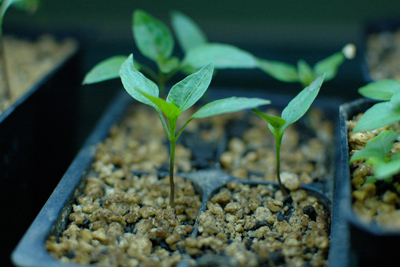 Seedlings prefer a temperature around 60 degrees F. Sturdier plants will be produced at this moderate temperature. Some recommend a 5 to 10 degree temperature at night. Too much warmth can produce tall, weak, spindly plants. As soon as seedlings have sprouted, they should be placed in a bright location, but not strong sunlight. A South facing window will do, but it may not be ideal, so try turning your plants daily and insulating the windows at night. Plants may become spindly from too high of a heat-to-light ratio, or stressed by the drastic drop in temperatures at night. If you aren't lucky enough to have a greenhouse, fluorescent lights work very well. You can use four foot shop lights using regular (cool white or warm) or special grow light tubes. Special grow lights are necessary only when you wish to start plants for indoor flowering and fruiting. Otherwise, use one cool and one warm, or all cool, per light fixture. Avoid using all warm as this could make for spindly plants. Lights should be placed 3 to 4 inches above the seedlings. As the plants grow, maintain the 3 to 4 inch distance between plant and light. Lights should remain on for 12 to 15 hours a day. Timers are well suited for this. My first made stand used 2 x 4s and plywood shelves. It held 12 four-foot lights on chains. Now I'm using 4 foot long baker’s racks, which are easy to assemble, and the wire shelves are perfect for attaching the fixtures. You can find them at some used restaurant supply stores, or stores going out of business. Once seedlings have developed their first set of true leaves (the second two leaves), you'll need to start feeding them. Water them once a week with a fertilizer that you've mixed half strength for roughly two weeks, then gradually increase to full strength. Fish emulsion, seaweed fertilizer, or a mixture of both work well here. Damping off doesn't give you much warning. The first sign that you have a problem is the total collapse of a few seedlings, green leaves still intact, but the stem has withered away at soil level. Young seedlings are most vulnerable, and once they have been attacked by the damping-off fungus, they can't be revived, as the lifeline between root and stem has been cut off. Prevention is best. Avoid damping-off by using sterile growing medium only. Also sterilize all containers and tools used in the sowing process. Sow seeds thinly to allow healthy air circulation, and thin to avoid overcrowded containers. Watering seed trays from below is best, but not always possible. Avoid over watering, keep medium moist, but not wet. Maintain good air circulation, and fertilize only after seedlings develop their first set of true leaves. If the problem occurs, immediately remove tray to a more open area. If soil appears too moist, let it dry up a bit. Remove all dead plants and the surrounding plants from the tray. Seedlings grown from very fine seeds will probably need thinning before they are large enough to transplant. Thin to one plant every one and a half to two inches by snipping off at soil level. Seedlings not planted in individual pots need to be transplanted when they have developed their first true leaves. Plants that take well to the transplanting process are usually greatly improved by the experience. Fine roots are broken by the transplant process, and as a result, a new, bushier network of feeder roots is formed. Repeated transplanting, three to four times, before planting outside, produces stocky, well rooted plants, but it is not necessary- I'm lucky to be able to do it once! First prepare your flats or containers you'll be transplanting into. Use a transplanting medium, potting soil mixture, or your own blend, it need not be sterile. Prick out seedlings gently, loosening a small clump from the tray using a small knife, Popsicle stick or similar object. It is very important that the roots never dry out. Using a pencil as a dibble, make a small planting hole for each seedling. If transplanting to flats, holes should be placed at least two to three inches apart, and at least three inches if they are not likely to be transplanted again before planting outside. If using separate containers or six-packs, put one seedling per container or compartment. Carefully separate individual seedlings from the clump, when possible, each with a clump of soil around the roots. It is better to hold seedlings by their first leaves rather than their easily bruised stem. Position the plant to be the same level in the soil or slightly deeper than before transplanting. There are exceptions, such as tomatoes, that you can plant all the way up to the true leaves, as roots will grow off the stem. Tamp lightly around each seedling, moisten immediately. It is recommended that you moisten the soil by placing the containers in a shallow dish of tepid water to allow absorption, or mist until thoroughly moistened, using water that has set to room temperature. Water that is straight from the tap can shock the delicate seedlings. This is the time to start lightly fertilizing with a weak solution of seaweed and/or fish emulsion. Always label the containers with plant variety and the date they can be safely put outside. Once the weather has warmed up, it is necessary to harden off your plants. You do this by gradually exposing them to the outdoor weather. One week before transplanting outside, start the process by moving the plants outside into a sheltered, shady area, such as a porch, cold frame, or under a tree. If it gets cold at night, or windy, move them back inside. Gradually increase the amount of sun each day, making sure they are well watered. 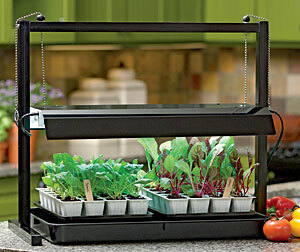 Cold frames are very useful, and are similar to a miniature greenhouse. They can be as simple as just bails of hay and an old window. They are great for starting seeds in early Spring or late Fall. 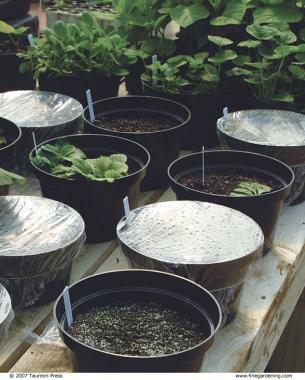 Perfect for hardening off your seedlings, or extending your season by protecting from frost. Southern exposure is a must, with some protection from cold winds, and as close to a 90 degree angle to the sun as possible.